Elaine Hancock (Olney, United States) on 16 July 2017 in Landscape & Rural. This was taken in Tuscany in May, 2016. Quel décor et iamge quel vue NB ce champs ce ciel mervielleux. Bel arbre solitaire sous ce ciel menaçant. such beautiful composition, layers, clouds & lights! Good composition in this serene landscape. Nice treatment too. The sky is what jumps out at me. So dynamic. 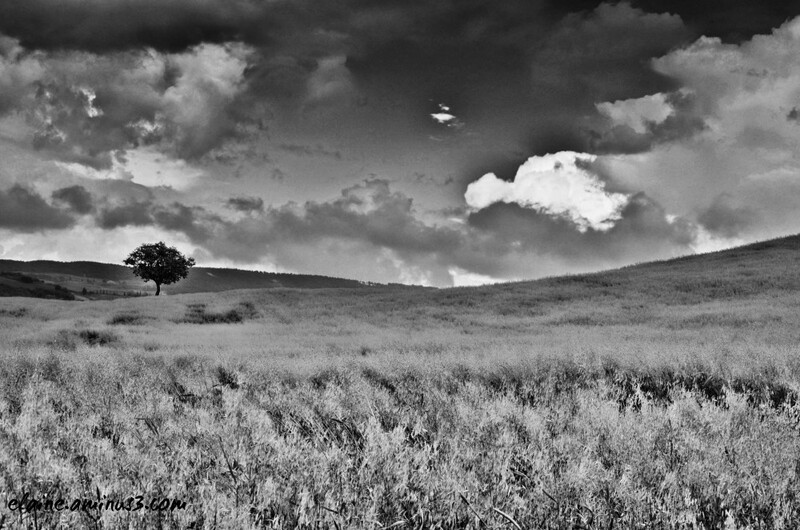 A fine black and white image of this landscape. I'm partial to black and white and this is an excellent one. @Ruthiebear: Thank you Ruthie! I really appreciate it! One of these days we need to meet up somewhere! This had to be a Spotlight. A superb image. @Shaun: Thank you very much Shaun. I really appreciate it. @omid: Thank you so much Omid! @Mhelene: Thank you very much Mhelene! Superb composition, congrats dear Elaine !!! @Tede: Thank you so much Tede! Magnificent! Congratulations on your spotlight, Elaine! @Mireille T.: Thank you so much Mireille! Very artistic black and white, many congratulations Elaine. @Curly: Thank you so much Curly!